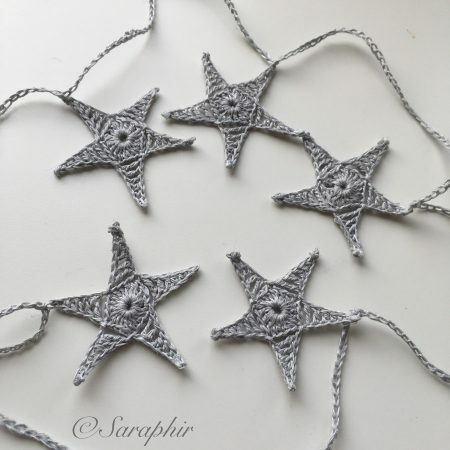 I had the idea for making this Simple Star Garland last year during my markets, but somehow got sidetracked and had 7 small stars lying around for over a year waiting to be finished. So I decided this year that as this is the first year I’m spending Christmas in my (now not so new) flat in Edinburgh, I would finish the garlands for myself to decorate my window. One thing led to another and the Star Garlands got interspersed with garlands with my Mini Starburst Snowflakes and Starburst Mini Me Snowflakes – all in off-white and silver grey – and I’m very pleased with the result. 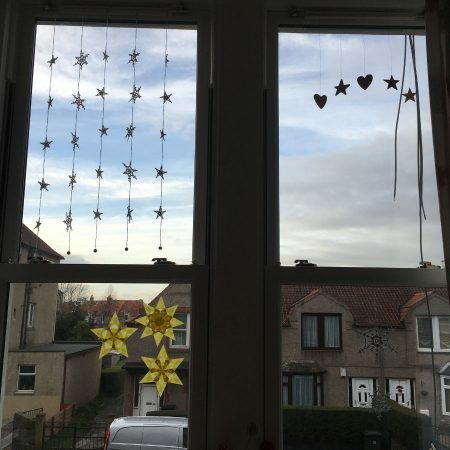 The beauty of making your own is that you can adapt the length of the garland and the number of stars to fit your own windows. I made my garlands around 90 cm and put 5 stars or snowflakes on them. 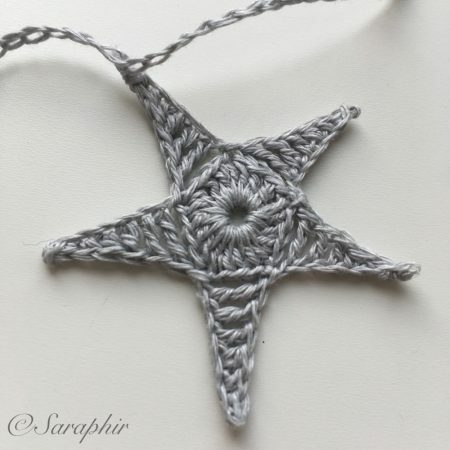 I made my stars and garland with 3-ply linen yarn using a 2 mm hook, which makes them small and very fine, but any yarn can be used. 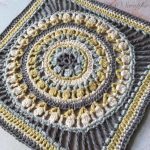 They still need blocking once they’re made as they tend to curl, but depending on what yarn you use they may not need stiffening. If they do, I would recommend brushing a mixture of PVA glue and water on the back. The mixture will keep well in a small sealed jar, so you can make lots so you don’t have to make it every time you want to stiffen something. 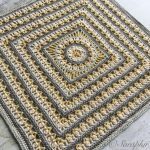 I give the pattern below in both UK and US terms – you can find a guide to the abbreviations on my page Crochet Terms. 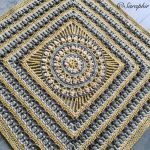 Please remember that this is my design and my copyright – feel free to use the pattern for yourself, but please do not claim or publish it as yours. 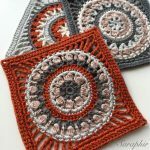 I’d appreciate it if you credit me as the designer if you post pictures or sell what you make online – thanks! Foundation ring: ch 4 , ss in 1st ch to form a ring. Round 1: ch 3 (counts as a tr), 19 tr in ring, ss in 3rd ch of ch-3. Round 2: * ch 7, along ch-7: (1 dc in 2nd ch from hook (just in the one loop), 1 dc in next ch, 1 htr in next ch, 1 tr in next 2 ch, 1 dtr in next ch ), skip 3 tr, ss in next tr * repeat 4 more times from * to *, ss in last ss from R1. Fasten off and sew in ends. 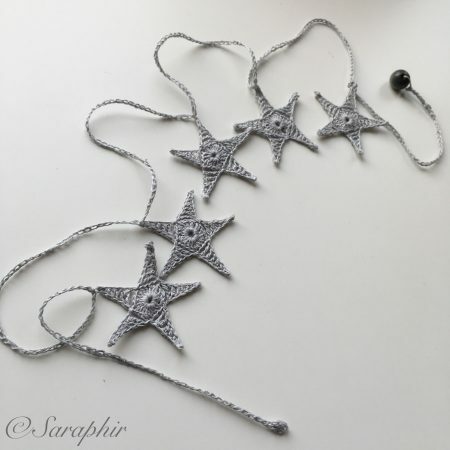 * Chain 15 cm, insert the hook into the top loop on the tip of one of the stars * repeat from * to * 4 more times, chain 15 cm, ss to 4th ch from hook to form a small ring. Fasten off and sew in end. 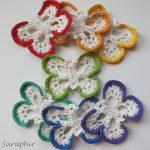 At the other end (the starting end, which is the bottom of the garland) attach a small wooden bead or something similar to give it weight when hanging and sew in ends. Round 1: ch 3 (counts as a dc), 19 dc in ring, ss in 3rd ch of ch-3. Round 2: * ch 7, along ch-7: (1 sc in 2nd ch from hook (just in the one loop), 1 sc in next ch, 1 hdc in next ch, 1 dc in next 2 ch, 1 tr in next ch ), skip 3 dc, ss in next dc * repeat 4 more times from * to *, ss in last ss from R1. Fasten off and sew in ends. * Chain 15 cm, insert the hook into the top loop on the tip of one of the stars *, repeat from * to * 4 more times, chain 15 cm, ss to 4th ch from hook to form a small ring. Fasten off and sew in end. 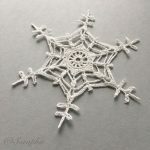 At the other end (the starting end, which is the bottom of the garland) attach a small wooden bead or something similar to give it weight when hanging and sew in ends. 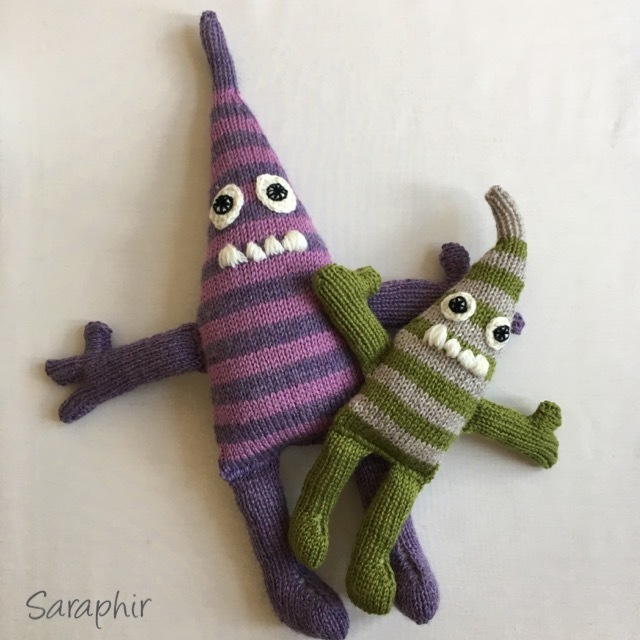 Have fun making! 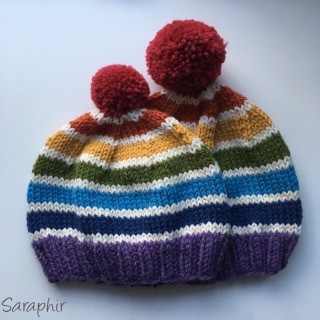 I would love to see your versions, so feel free to share to my Facebook Page or to tag me on Instagram – @saraphir.